"Eloqua is a marketing automation software that allows marketers to plan, create, and implement their campaigns." 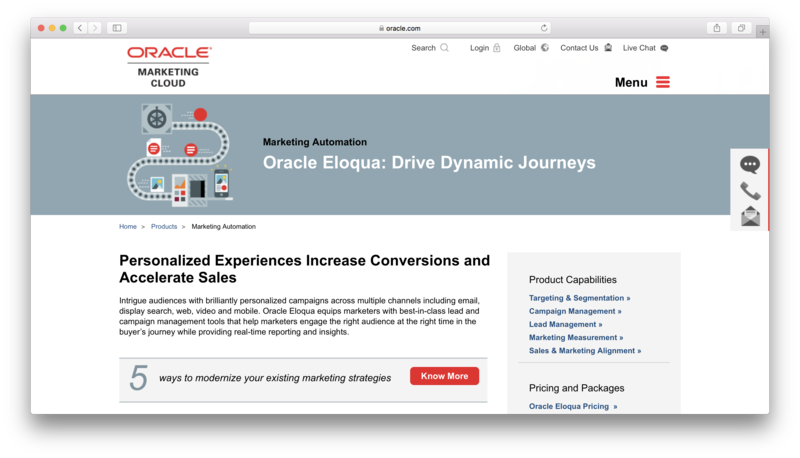 Oracle Eloqua, also known as Oracle Marketing Cloud, is a marketing automation software solution designed for small- to medium-sized business and large enterprise marketers. It is a software-as-a-service (SaaS) marketing solution that allows users to plan, create and implement workable marketing campaigns. The software solution is designed to meet the specific needs of both B2B and B2C marketers. At its core, Eloqua is an email marketing automation solution generally used by companies of all sizes and in different industries, although the system is best suited for mid-sized to large-scale enterprises. This particular marketing automation solution is tailored to organizations and companies with serious marketing needs. Eloqua offers an intuitive marketing automation solution utilizing a drag-and-drop mechanism, making it easier and more convenient to use for most users regardless of their level of experience. Oracle Eloqua features a practical user interface that effectively illustrates the step-by-step process of the user’s marketing strategy. It has features that allow you to build targeted segments and facilitates email campaigns from a single platform, eliminating any inefficiencies and unnecessary complexities often associated with sophisticated marketing campaigns. Doing a little research on Oracle Eloqua will probably give you an idea of its status in the industry. It is considered to be one of the most robust marketing automation software solutions available, and for good reason. With its well-designed user interface, the practicality of most of its features and the simple yet comprehensive central dashboard are among the many reasons why Eloqua is quite known to be one of the most user-friendly marketing solutions in the industry. These components essentially make the entire marketing automation process more intuitive and efficient. The tools and services any marketer might need such as online forms, landing pages, email service and so on are all carefully organized in one location for quick and easy access. The company contacts, accounts and leads are also neatly placed in another location that is equally accessible to the user. Oracle Eloqua provides users with great value as the software solution packs quite a hefty kit. Its features are not only extensive; they are tailored to improve the marketing automation process as well. Not to mention the fact these same features are designed to boost conversion rates and make the allocation of marketing budgets more efficient. Reporting and analytics – Such capabilities are inherent in most marketing automation available, but most of the competition doesn’t come close to Eloqua when it comes to the effectiveness and practicality of the system. Email marketing – This is the heart of any marketing automation software solution. The email marketing feature of Eloqua is simple yet powerful. You don’t have to be an expert in coding or invest heavily on IT to take full advantage of this feature. Dynamic content – Any seasoned marketer knows the value of quality content. Eloqua’s dynamic content feature allows users to be more effective and precise when creating content for their marketing campaign. Of course there are a lot more features in this software solution that will benefit all kinds of businesses and organizations, these are just a few you might find interesting. Adequate support when it comes to software solutions is one of the most important aspects you have to consider.The level of support you get from the developer or the service provider can affect your overall experience with the software solution. Eloqua offers 24-7 customer service via toll-free phone lines and live web chat. Professionals on the other side of the line are eager to help you out with whatever problems you might have regarding the software. A help center is also available if you want to communicate with other Eloqua users or access resources and training materials to help you be more effective in using the product. Oracle Eloqua offers three pricing packages aimed at mid-sized to large-scale enterprises, as you will notice in their rates. These plans are billed on a monthly basis and they mirror the cost for implementation with a database of no more than 10,000 contacts. Contact the sales team at Oracle for more info on pricing and additional features for the Enterprise package. Is the product a good choice for your business? All in all, Oracle Eloqua is a good marketing automation software solution. It is packed with all kinds of features to help boost the effectiveness of marketing campaigns. However, this software is not necessarily a practical choice for smaller businesses with limited marketing budget or contact rolls. Yes, the software might be designed to serve small- to mid-sized businesses and large enterprises, but you still have to consider whether or not the solution actually addresses your company’s needs in the most efficient way. What platforms does Eloqua support? Who are the main user groups of Eloqua? Does Eloqua integrate with any other apps? Does Eloqua offer an API? Does Eloqua offer guides, tutorials and or customer support? What are some applications Eloqua is commonly used in tandem with? Does Eloqua offer multi-user capability (e.g. teams)? What is Eloqua generally used for?